Welcome to St Cadoc’s Church! We are a large urban parish in south east Wales, situated in the ancient town of Caerleon, near Newport. 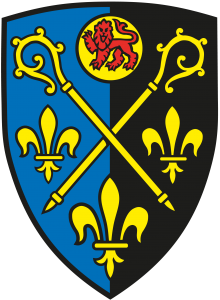 We are linked with the parishes of Llanhennock, and Llanfrechfa with Llandegfedd and are formed into one Ministry Area. The church building is located on the one-way system, next to the National Roman Legion Museum. The building is generally open during the daytime, but may be closed for services or other activities. We have a growing relationship with the Charles Williams Church in Wales Primary School, one of the largest church primary schools in Wales. Our website is www.caerleonministryarea.co.uk. We do hope to welcome you in person. Come and visit us! St Cadoc’s is a large church and is well-attended. We hold a variety of services – traditional and more modern and there is a welcome for everyone. The church stands in the centre of the Roman Legionary Fortress of Isca, over the principia or headquarters building where the Legionary Standards were kept and statues of Roman Emperors venerated. Morning Prayer (30 mins) is at 8.00 am from Monday through to Thursday. The church building is generally open during daylight hours but may be closed unannounced. Caerleon is well served by public transport and there is adequate parking in public car parks. Street parking is quite limited and the town gets very congested at school drop off and pick up times.